When choosing window frame colors, the appearance of your roof is one of the main things you should consider. This is especially important when your roofing system still has decades left in its perceived service life. Considering that it represents a significant portion of your home’s curb appeal, it should dictate the look of your windows and their accompanying trim. Soft, gray windows and trim go well with dark, gray roofs. The harmony between them feels natural since they have different shades of the same color. The softness of the pastel allows the dark roof to shine while subtly highlighting wall openings. This visual effect is more pronounced when the siding is relatively cheery. The best part is that gray is both trendy and timeless. It wasn’t long ago when it was all the rage; home designers couldn’t get enough of it and experimented with its different shades. Its popularity may have cooled down a little bit, but it’s not like other fads that quickly turned irrelevant. As a neutral color, gray can make energy-efficient windows fashionable for long periods. White can mesh with literally any hue, but it comes alive when placed next to dark colors. It creates a striking contrast between the windows and siding panels. It can also help tone things down, fighting against the darkness of the color palette to keep the eye from getting overwhelmed. Like white, black appears stunning anywhere, but it pops out when the background is light-colored. It ties windows with the gray roof and boldly separates them from the bright-hued siding. It can be energizing and produce an illusion of richer architecture. Savvy windows installation specialists would attest that black is currently trending, which can instantly update the look of your home. 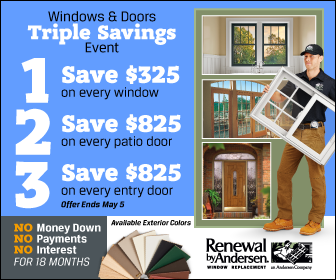 Renewal by Andersen of St. Louis offers a remarkable selection of window frame colors, including stainable, real-wood interior choices. Call us at (314) 332-2364 now to schedule your consultation to learn more about our customization options and get a FREE estimate. We serve St. Charles and the neighboring Missouri areas.